Our longest missionary involvement in Australia is with the Aboriginal people. Thank you for the enrichment that we receive from you." The Franciscan vision of a universe where all are sisters and brothers fanned the desire of Hélène de Chappotin, our foundress, that the FMM would share Eucharistic presence and contemplative adoration in the fartherest continent, Australia. She did not see her dream realized but it became a reality in 1941. First contact with Australia was through China in 1928 when two sisters came to sell hand-crafted church vestments and laces, product of their workrooms which gave alternative employment to Chinese women. In 1935 Giovanni Panico who had experience of the FMM in Argentina and Colombia was appointed apostolic delegate to Australia. He saw the FMM as a possible solution to providing domestic staff for the new seminary that was to be opened in Banyo, Brisbane. He negotiated this as an opening to future ministries in Australia. We accepted and on March 25, 1941 three FMM, a Dutch, a French and a Belgian, came from China in time for the opening of the seminary. They were soon joined by five more from USA and Canada. 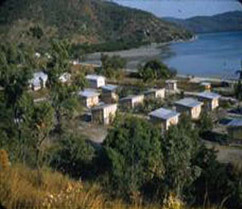 1944 - Archbishop Duhig requested the FMM to take over the care of the Leprosarium on Fantome Island and the primary school on Palm Island, both aboriginal settlements under Government control. He also offered Kedron Lodge in Kalinga for a novitiate. By the end of the year all three communities were installed and the first postulant received in March 1945. USA and Canada again supplied the personnel with the exception of the Irish Novice Mistress who came directly from India. 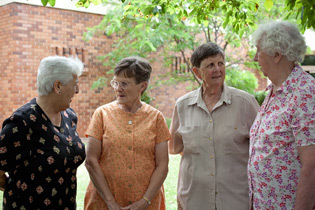 1945 - The Legion of Mary welcomed five FMM from Canada and USA to replace them at the Ave Maria Retreat House for Women in Essendon, and in July 1946 England and Ireland sent six young sisters to replace the Good Samaritans in their home for aged women in Buckingham Street South Sydney. 1947 - The novitiate transferred from Kalinga to Mittagong in the Southern Highlands NSW where the novices were faced with the formidable task of turning a 280 acre run-down property into a self-supporting farm. Guided by the expertise, dedication and inspiration of a Dutch sister, Elizabeth Balvers, Our Lady of the Missions Novitiate farm became renowned in the Southern Highlands for the quality of its produce and its pedigree breeding. The novices also flourished in the healthy fresh air though sometimes they admitted to a tear or two in the bitter cold of the dairy, the piggery or the hen house. 1947-49 - First mission sendings : six to India, two to Ceylon, two to Burma and four within Australia : Palm Island, Brisbane, Sydney, Melbourne. An influx of missionaries who had been expelled from China during the communist revolution led to forming the new province of Australia, Malaysia, Singapore and Indonesia and greatly enhanced the internationality of the communities and our ability to respond to new needs. Brisbane - Xavier Hospital for Children, Coorparoo. Partnership with Little King’s Movement in Buranda for pastoral care of persons with disabilities. Melbourne - Ave Maria Kindergarten, Our Lady of Nativity Primary School, and Ave Maria College in West Essendon. Sydney - Ave Maria Retreat House , Point Piper. 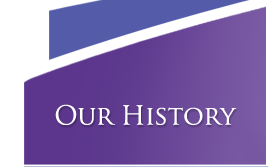 From Ave Maria sisters undertook a variety of ministries which included Catholic Media, Catholic Social Services and Migration Offices. Student sisters from Malaysia, Singapore and Indonesia joined young Australian sisters in obtaining professional training for their future ministries. 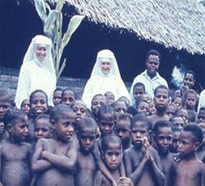 In 1966 it became the provincial centre for Australia and Papua New Guinea. Our Lady of Consolation Home for the aged in Buckingham Street transferred to new, spacious premises at Rooty Hill. The sisters also staffed St Aiden’s Parish Primary school and establised St Agnes Girls College to cater for the new migrant population. Canberra - 1963 Three FMM moved into a caravan in time to join the staff for the opening of the first regional Catholic College. 1966 Marymead Children’s Centre, Narrabundah, was established to help relieve the stress on young families who were moving into the national capital without any of the informal supports of extended family and friends. Perth - Our fourth Retreat Centre and a kindergarten were opened at Victoria Park and led to later moves into the Bunbury diocese for ministry with the Aboriginal people. The Franciscan diocese of Aitape in the West Sepik district needed teachers and nurses to help set up primary schools, medical clinics and patrols for the scattered villagers of the Torrecelli ranges. The first group of five went to Seim in 1965 and were eagerly joined by others from many parts of the world in the succeeding 35 years. Mission sendings beyond Australia were to India, Ghana, Liberia, Singapore, Malaysia, Indonesia, Papua New Guinea, Austria, and Italy. Mission sendings to Australia came from USA, Canada, England, Ireland, Scotland, Malta, Spain, Philippines, and included many European sisters who had been expelled from China. The two aspects of FMM life that appealed most to the Australian women were Eucharitic Prayer and Global Mission with its diversity of ministries. This is borne out by the fact that the retreat centres founded successively in Melbourne, Sydney, Brisbane and Perth were our main source of vocations. When three astronauts walked on the moon and photographed the earth as a single globe in an ever expanding universe human consciousness took an immense leap. Previously unimagined possibilities began to surface along with a new sense of global interdependence in a world at once so beautiful and so fragile. the cloister gave way to simple suburban housing and community life became less formal. Large institutions were entrusted to lay administrators and staff. Missionaries became even more mobile, new missiological disciplines were studied and formation programs were updated. The novices transferred to Canterbury to avail themselves of Yarra Theological College courses. Postulants and FMM completing secular studies moved to West Sunshine, and intensive mission studies were followed at the Pacific Mission Institute in Turramurra. Migrant social work and pastoral support, hospital and prison chaplaincies, parish pastoral ministries, were taken up in Warrawong, Deception Bay and Mitchell Park . Aboriginal pastoral support was extended to Townsville, Mt Isa, Alice Springs, Collie and Wagin. In Papua New Guinea the work began in Seim had already been extended to Wati and Kafle. Shared ministries with other congrations now opened doors in the coastal towns of Aitape, Wewak, Lae and Port Moresby and to the Melanesian Institute in Goroka. The sendings from Australia broadened to Pakistan, Morocco, Tunisia, Ghana, Liberia, Senegal, Ethiopia, Kenya, South Africa, Argentina, Brazil and Columbia. The sendings to Australia were fewer but a new enrichment came from the return of those who had completed their overseas ministry and had chosen to return to the familiarity of their own culture. They brought with them a wealth of experience for supporting those who struggle with cultural adjustment and to finding the way forward in a foreign land. Many of Hélène de Chappotin’s most beautiful and mystical writings were penned during the time she was deposed as Superior General and the future of the Institute was so unsure. For her it was not only a time of pain but also one of prolonged prayer before the Eucharist and insight into the true power of beauty, truth and love. She surrendered herself to live only of that power and to follow wherever it would lead her. "Where are you leading us?" Today the FMM in Australia are living the same question. Like our sisters in Europe we live with an ageing population in which the vocation to religious life is chosen by very few. 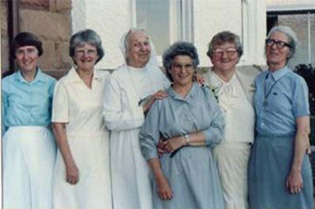 The majority of our members are gradually celebrating their Golden Jubilees and although this does not mean they have retired it does mean that the future is not their’s to shape but in the hands of a small number of younger FMM and the dedicated laity who have caught the spirit of Hélène de Chappotin and are furthering it in the institutions that the FMM have confided to them.